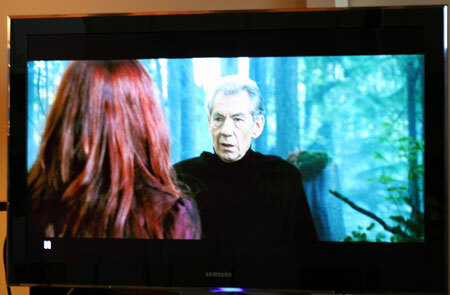 This scene of Hally Berry from X-Men The Last Stand shows how high contrast can appear on the 46B8000. Aesthetics – 1.2" depth. Great looking TV. Processor Testing:This LED TV tested very well in when we ran it through a series of processor video board testing. 480i DVD and Broadcast Viewing: For any film based material start by turning off the 120Hz/240Hz rate feature as follows: Click Menu/picture/Scroll down to Picture Options/Press enter/Scroll down to AutoMotionPlus 240Hz/Press Enter/Scroll or press to Off position. It is important to turn this feature off (see more on this feature under features section below). 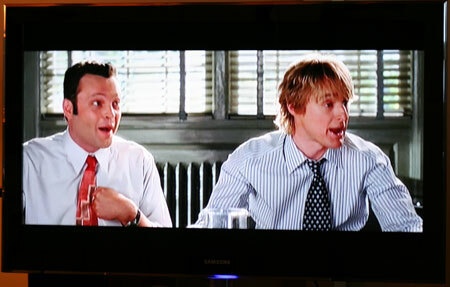 The 46B8000 did a good job with this shot from Wedding Crashers. There was no flicker from the horizontal blinds in the background and though the scene is bright there is still good shadow detail in the background. 720p/1080i/1080p Picture Quality: There is nothing subdued about this LED TV, from its super thin good looks to its super saturated colors. Blacks are rich and deep and colors vibrant if not over powering at times. Some dark shadow detail is lost and and subtle color notes forgotten. But it's a colorful picture many will relish. Read our extended picture notes below. 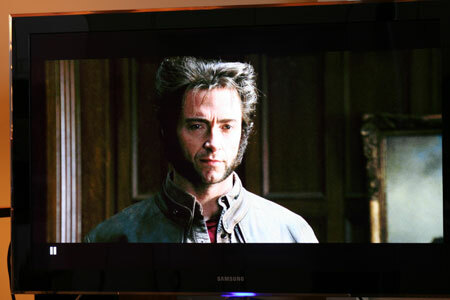 Hugh Jackman's hair is fully detailed in this scene from X-Men The Last Stand. 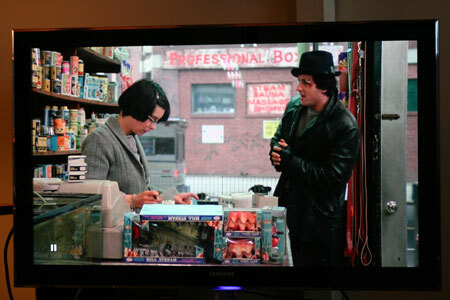 This is a clean, clear presentation of a detailed and colorful shot from the Blu Ray version of Rocky. Black Level/Contrast: With color information both light and dark appearing so deeply saturated, contrast effect is excellent. Blacks appear inky and sometimes lose dark shadow detail. White light sometimes is distractingly too bright. Contrast appears more intense on the screen than the average of 900:1 post calibration ANSI checkerboard pattern contrast that we measured. See calculations here. Dark Shadow Detail: As a result of the super saturated blacks, shadow detail can get lost in some scenes. In others, it was fine. This type of scene from X-Men The Last Stand presented challenges as the 46B8000 couldnt maintain shadow detail in characters cloak. Color Rendition/Color Accuracy: We found color rendition continually vibrant but over saturated. Blacks can get oversaturated at times as can white. Viewing Angle/Off Axis Viewing: At 40 degrees off axis contrast is significantly reduced and black levels become hazy. However, the destruction of contrast and black levels stops there, not continuing as viewing angle widens. The screen remains perfectly viewable even at from side angles (with the reduced contrast). Motion Lag: The UN55B800 did a good job eliminating motion lag and judder. There was some notable jerkiness in a few scenes panning side to side with the AutoMotionPlus feature turned off. False Contouring/ Mapping: When viewing the rough 1997 Risky Business version of Risky Business much false grain and mapping information was visible. This was somewhat surprising given the excellent results of the 55B8000 in processor testing. Inputs: Amazingly with this thin screen Samsung has managed to fit 4 HDMI slots, a PC slot, a LAN Cat 5 slot (for Internet connection), 2 USB ports, and a component video input. Aesthetic Considerations: The 55B8000 comes with a 20 degree swivel table top stand. The stand is heavy, sturdy and a nice matte silver accent to the all gloss black screen. There are accompanying screws to further secure the stand to the TV. The super thin screen itself we measure at 1.2 inches in depth. It is obviously sleek and attractive with the surrounding frame measuring 2" in width. The frame has a subtle invisible edge feature with clear acrylic on a silver backing. Remote Control/Menu Funtionality: The Samsung UN46B8000 comes with 2 remote controls. One is substantial, backlit, complete and well designed with gloss black finish and every ergonomic enhancement imaginable. The remote wheel is catchy but not necessary. Clicking the edges of the wheel accomplish the same tasks as scrolling the wheel and expedites changes. This standard remote control contains a discrete button called P. Size for changing the video aspect ratio. The second pod-like diminutive remote contains a center arrow keypad for controlling basic functions; power, next channel, and volume. The TV menu is not accessible with this remote. The overlaid Menu system is very attractively laid out and thorough, but slow and cumbersome to navigate. Audio Output: Sound volume levels seem weak from the 10W X 10W built in speakers. We can understand the challenges for speaker placement in a 1.2" deep TV. For a majority of programming changing the mode to movie, and utilizing the Clear Voice feature will help a lot to improve voice tone in DVD and broadcast material. SRS TruSurround is a useful feature for HD content but it doesnt help voice tone. Overall, we were not impressed by audio delivery from the UN46B8000. Features:The Samsung UN558000 is loaded with extra features, some surprising, others more useful. AutoMotionPlus 240Hz Refresh Rate. 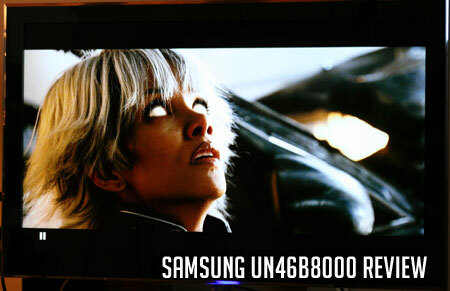 Samsung has increase the frame rate conversion to 240Hz on the B8000 as the one of the premium markup features. See our complete article about 120Hz/240Hz rates here. This feature is awesome on the Standard setting for sports programming and gaming. Turning it off during film and broadcast viewing will save you from the cardboard cutout soap opera effect and deconstruction of cinematography that this feature creates (in film playback). Internet Connectivity: Connect to the Internet to see Yahoo news, Flikr, witter, Yahoo Finance, Yahoo Video. The package is canned and weak in our opinion and this is not a feature you will use much if at all, especially when you get frustrated by the slow click and wait response (sometimes up to 5 seconds). The feature is frankly a little gimmicky. You can make this feature wireless with an optional accessory. Media Play: Use this feature connected through USB to keep picture and video files. Clear Voice, SRS and Movie sound options are listed above under Audio Output. Video Aspect Ratio Sizing: 16:9, 4:3, Zoom 1 &2, Wide Fit, Screen Fit round out a complete set of options for viewing modes controlled by P. Size button on the remote. Price Considerations: At $2100 the UN46B8000 is not a discount TV. It demands a premium for its premium build quality and some of Samsung's newest technology including 1.2" depth, LED backlighting, Internet connectivity, a nice heavy table top stand and remote, and one of the best looking panels we've seen. Competition hails from the Sony KDL-46XBR8 (local dimming LED backlit see review here) which sells for $2500 and measures higher in contrast. Both sets have their own advantages in certain areas so read the reviews to decide. LG has several models that will provide competition in the future in the LG 47LH90 ($2500) has 240Hz processing and the LG 47LH50 ($2000) which has 120Hz processing but Internet capability including Netflix. The Sharp LC52E77 is a non-LED backlit lower end unit from Sharp.